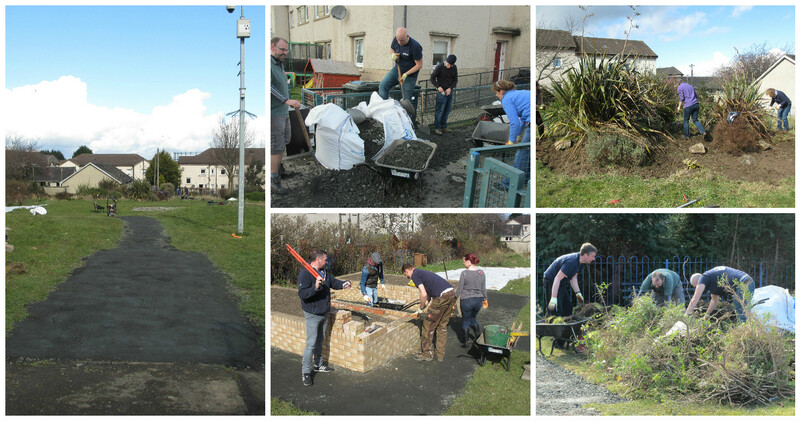 A huge well done to the Weekend Resource and gardening volunteers for all their effort in PEP’s front garden. The group have been working hard since August to redesign and brighten up the entrance to the PEP Centre. They have been getting rid of some of the old plants, moving some to new homes and planting new ones, including spring bulbs, feature trees and bedding plants. Our thanks also to Volunteering Matters for their Action Earth Grant, which has allowed us to make this project happen! After a lot of hard work from the Neighbourhood Group and the Weekend Resource, the rear garden has been producing some wonderful food. So far the groups have used courgettes, cucumbers, lettuce, onions, peas and rhubarb. The carrots, tomatoes and potatoes should be next on the dinner plates with broad beans still growing well. The final crop will be sweetcorn; the cobs are growing well, but with the best of the summer behind us, the race to get them ripened is on! The side garden has also yielded some soft fruit; redcurrants and gooseberries with blueberries still ripening on the bush. It’s been a great first year for the new garden… we look forward to next year! PEP’s sensory garden at the rear of the office has always been a favourite spot for people to sit out at and enjoy the famous elusive Scottish sun. But over the years the garden has become more and more wild, with large plants taking over and ivy covering half of the area! We were delighted then that the PEP Neighbourhood group’s continued working partnership with ‘Edinburgh Lothian Greenspace Trust’ has culminated in the Trust providing funding for the garden to have a complete makeover. The Trust employed contractors to come in and completely redesign the space, with input from PEP service users, volunteers and staff. The three contractors wasted no time in getting to work and digging out all the old established plants and readying the ground. New steps were built with a path to access the upper levels of the gardens and fabulous planters have been created from old tyres; not only for recycling, but also to enable people with all abilities to get involved in gardening. The team even created a foldaway work table meaning that potting can be done by the group on site and then be cleared away to make the most of the space. The side garden has also been cleared with a path created to what will be PEP’s soft fruit area. Whilst there is still a lot of work to do, with the contractors coming back in a few weeks to continue their amazing work, the garden is already vastly different with more light and more space for gardening. Once the work is completed the Neighbourhood group will set to work to plant up the garden once again with the help of Edinburgh Lothian Greenspace Trust and the Weekend Resource will be decorating the planters to bring more colours into the space. As always PEP’s Summer Fayre was held in the community gardens opposite the offices at 3 West Pilton Park. The fayre was opened by manager Helen Tait and 5 band members from the Davidson Mains & District Pipe band. 4 pipers and a drummer started off the proceedings and played several rousing tunes expertly and professionally. The BBQ was manned by volunteers and produced a steady stream of food and drink for everyone to enjoy. There were stalls for fundraising or giving out information; these included the Bright Sparks Nursery, The Edinburgh North West Carers, the Weekend Resource, the Neighbourhood Group, PEP Pets, Scottish Gas and Tony’s Tombola. Leanne from the Pilton Community Health Project also kept people busy with some seated exercise in the centre of the gardens. Emily also came along and provided more fun for the kids (and some adults too) with fantastic face painting. A huge thank you to Clare and the Davidson Mains & District Pipe Bank, Leanne for the seated exercise, Emily for the face painting, Scottish Gas for volunteering and fundraising and all the other volunteers and organisations who were able to come along on the day and make it such a wonderful success. Thank you also to Morrison’s Ferry Road and the Edinburgh Cyrenians for their continued support.